With more pet ownership than ever before, there has never been a better time to get into the animal grooming industry. Whether you wish to start your own business or gain employment as a groomer, this course is a great first step along that path. Grooming is Not Just a Luxury! Grooming is a natural behavior in animals. It is often considered an innate behavior which means it is behavior that occurs without obvious environmental stimuli. Grooming also serves to establish and cement hierarchies and relationships within animal communities. Instinctive acts and innate behaviour are considered to be coordinated movements and actions in response to stimuli. Some examples of natural grooming include cats scratching on posts (or furniture, or trees), licking, preening and dust baths. You will often find animals in herd or group situations grooming each other. A commonly recognised example would be monkeys picking each other’s coats for parasites. Some of these actions serve to sharpen or maintain claws, some to rid coats or features of parasites, some to smooth the coat – but each to maintain the integrity of the integumentary system. The integumentary system, which is detailed in lesson two, is the system of the animal comprising the skin, hair and nail features and variations. This system is integral in protection of the internal structures, hence regular maintenance of this system will serve to enhance the health of the animal. 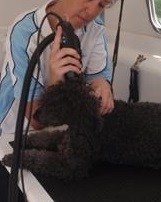 Grooming is a key component of any animal care regime. It is essential to an animal’s health and welfare and can also provide aesthetic value. This aesthetic value may be used to promote an animal’s genetic potential for either commercial or social reasons. Grooming is widely preformed on pets, livestock and wildlife. People need to perform grooming tasks on animals which do not have direct access to their natural grooming systems and processes. In essence, by keeping and breeding animals out of their intended environment, we have limited their ability to perform these tasks for themselves. Therefore, in order to maintain optimal health, we must do it for them. It is assumed you already know animals exist in many different shapes and size, colours and textures. Some have long or short fur while others have scales or feathers. These physical and anatomical variations serve different functions for animals and can be aesthetically pleasing. However, these variations mean humans have to conduct a variety of grooming tasks in order to maintain the animals in their care. Some services are essential to the animal’s health and wellbeing; while other services (at the opposite end of the spectrum) may be more about marketing than any practical benefit. While most grooming techniques have been developed to fulfill practical necessity some techniques have been developed for aesthetic reasons. This mostly applies to companion animal grooming especially dogs, as dogs may be groomed to fit a breed standard or in a way to suit their owners taste, for example the classic poodle clip looks very different to the way poodle fur naturally grows. This also demonstrates the psychosocial role of grooming in some companion animals – it reflects on the owner and the value they place on how they are socially perceived. However, these enhancements are also applied to livestock in show situations, the purpose of which is to demonstrate their suitability for breeding and the superior traits which may be preserved by breeding with this stock. Our course can set you up with this knowledge.